The federal labour minister arrived in Bracebridge on Monday morning to announce there will be significant funding poured into 13 local projects throughout Parry Sound - Muskoka. “This funding will help start and grow businesses through productivity improvements, new equipment and technology, training, mentoring and access to capital. It will also help a number of young Canadians launch their careers while assisting local organizations and businesses access a talented and qualified workforce,” said the Honourable Patty Hajdu, Minister of Employment, Workforce Development and Labour. Muskoka Brewery will receive a $2-million loan to support upgrades to its manufacturing facility, allowing it to better compete with multi-national beer companies. 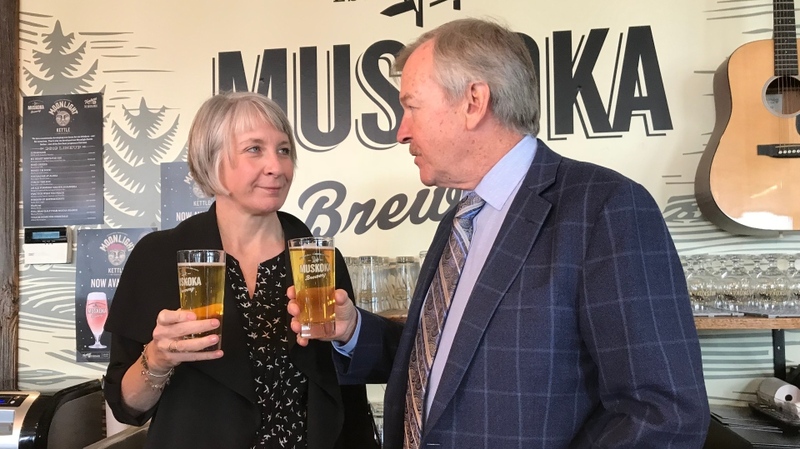 “Thanks to this investment, we have been able to boost production to meet increasing demand, and I am extremely proud to announce that we are now one of the largest independent craft breweries in Canada,” said Muskoka Brewery chairman, Bob MacDonald. The brewery is using the federal funding towards its $6-million capital expansion, which it announced last November, including the installation of new machines and efficiencies to increase its production rate, and get its brews to market more quickly. "The canning lines are in, the kegging lines are in. (The investment) took us from approxiately 90 cans per minute, to over 250 cans per minute, which is a significant increase obviously," MacDonald says. Muskoka Brewery will have 10 years to repay the federal government for its loan. Meanwhile, the Township of Georgian Bay is receiving a non-repayable grant from the government to the tune of $931,500. The goal is for the township to use the money to promote tourism, and stimulate local business growth. The Honey Harbour waterfront area will build new large and small vessel floating docks, and a pedestrian promenade. "We think that the retail and service businesses will increase, and therefore there will be more jobs long-term for the Honey Harbour area," township mayor Peter Koetsier says. This funding announcement comes just six months before the next federal election, and with MP Tony Clement deciding not to run again, the liberals are gunning for the seat. The labour minister admits timing for federal funding is key, but says Monday's has nothing to do with the election. “It’s not just about getting elected. It’s about understanding your region, and understanding the tools that will help your region thrive. I’m proud to do that whether it’s an election year or not,” she said. In total, $5-million will be split between 13 businesses and community initiatives throughout Parry Sound – Muskoka.